In English, two things which are opposites are sometimes called "chalk and cheese". 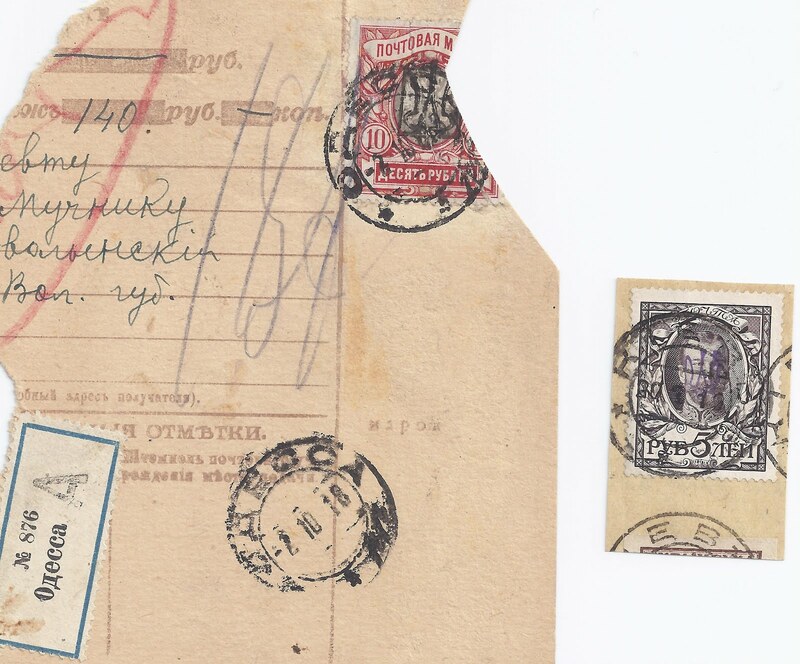 On the left, a Parcel Card fragment with badly clipped stamp cancelled ODESSA 2 10 18. The overprint is Odesa VIb. Go to Bulat and it is number 1369 valued at $275 mint and unknown used. Go to Dr Seichter and it is valued at 450 DM mint but, again, is unknown used. So here is a stamp which, from the catalogues, you will probably think a philatelic production and yet here is a copy used in the most non-philatelic way possible at an appropriate date. The stamp was even torn before it was used(* see footnote). Maybe it is the "only known" used [part of a] copy. It was in the Ron Zelonka collection. On the right, a 5 rouble Romanov overprinted with Kyiv I Broken Trident and cancelled KIEV 20 7 19 at which time Kyiv may have been under Red control. Anyway, go to Bulat and this stamp is unlisted; go to Dr Seichter and it is unlisted. Dr Zelonka signed it for me back in 2006. It's 100% genuine and 100% philatelic and may be the "only known" copy. It came from the Iwan Bobyn collection, part of which was sold at auction a few years ago. Which of these two items would you rather have in your collection, the chalk or the cheese? Both are for sale. * The fact that is torn may be a clue: suppose this stamp was produced for sale to a philatelist like Trachtenberg. Suppose it got torn by accident so could not be sold to him. Then maybe it was put into counter stock to be used up without causing an accounting problem.